Today we begin the Sundays in Ordinary Time of the liturgical year. This year, generally we would listen to the gospel readings from the Gospel of Luke. However, this Sunday we read from John – as is the case on the 2nd Sundays every year. And the gospel text narrates to us a wonderful and dramatic story of a wedding. What a way to begin this season of the year! And what an amazing way in which Jesus himself begins his public ministry! In the gospel text of today I clearly see two distinct parts – two epochs, in a sense: one, Before Christ; and another, After Christ. The first scene that John paints for us is one of emptiness, and the second, on the contrary, is marked by abundance. And what brings about the difference between two phases is the intervention of Jesus. I would like us to reflect on these two epochs, and see where we ourselves are! The narration is introduced as happening “On the third day…” (Jn 2:1). John is inviting us to be ready for a theophany – a special revelation of God. But when we examine further to see what actually happened on the ‘first day’ preceding this wedding, we are taken back to a series of events beginning from the first proclamation by John the Baptist (Jn 1:15, 29, 35, 45). The initial series of events happen in four days, and the wedding at Cana takes place on the seventh day (4+3), alluding to the story of creation – now, the new creation! In the Book of Genesis, what was the situation before creation? There was chaos, emptiness and darkness: “Now the earth was a formless void, there was darkness over the deep…” (Gen 1:2). The initial situation at the wedding in Cana, before Jesus revealed himself, was similar to the one in the book of Genesis: marked by emptiness, chaos and gloom. “And they ran out of wine, since the wine provided for the feast had all been used…” The marriage feast had ground to a halt! Wine is a symbol of celebration, happiness and mirth. They ran out of wine: they had no joy. There was gloom! The mother of Jesus discerns this situation. “They have no wine” (Jn 2:3), she informs the New Adam. The mother of Jesus is presented here as the New Eve. The first Eve found herself in a situation of abundance in the garden, but she initiated a breakdown of that paradise. The New Woman (Jn 2:4) seems to reverse this situation. She is here in Cana at the beginning of the new creation, she will be there again at Calvary at the climax of the new creation (Jn 19:25). Back in Cana, “There were six stone water jars standing there, meant for the ablutions that are customary among the Jews: each could hold twenty or thirty gallons” (Jn 2:6). The stone jars had tremendous capacity, but they stood empty. The old religion carried a great promise, but it stood empty. The number of stone water jars was six – one short of seven. Six is a symbol of chaos, imperfection and evil (Rev 13:18). Such was the situation at the wedding feast in Cana. Fortunately, for them and for us, Jesus also there (Jn 2:2) and his mother discerns that his hour had come (Jn 2:4-5). The New Eve believes in the Second Adam! She recognizes him as the Son the God! So Jesus takes over. 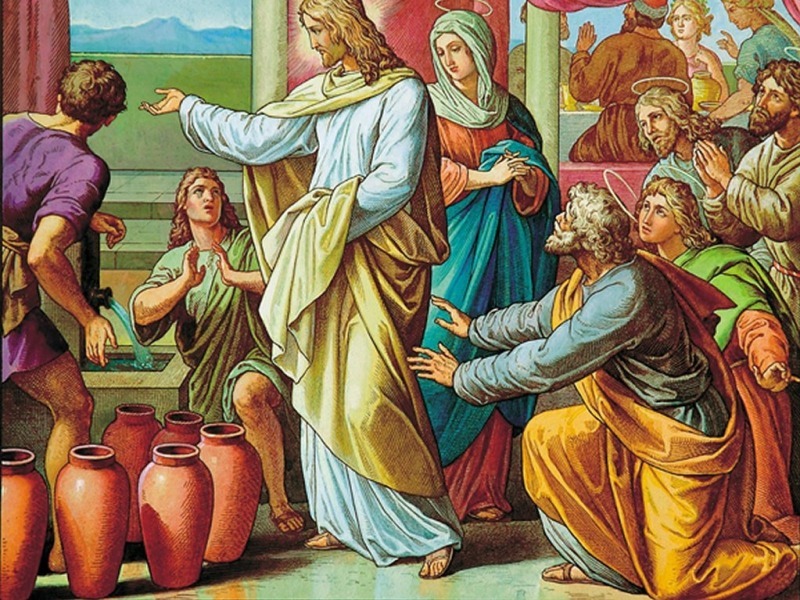 Jesus asks the stewards to fill the empty jars with what they have – water. “And they filled them to the brim” (Jn 2:7). There are signs of fullness, but the miracle is not yet. They drew some out and offered it to the president of the feast, “he tasted the water, and it had turned into wine.” In a sense, the transformation takes place as the president drinks the liquid. And it was the best wine! The celebration can resume! There is abundance, order and celebration. We could attempt to estimate the amount of wine that was there in the six jars at the wedding in Cana: Thirty gallons [times] six jars [times] 3.8 liters = 684 liters!!! A standard bottle of wine in most countries these days is 750 ml. So, in contemporary rendering, that would add up to about 900 bottles of wine! Remember, wine is a symbol of joy, mirth and celebration. And there was plenty of it. When Jesus would multiply bread on the shores of Galilee, there would be a similar situation (Jn 6). They begin with a situation of scarcity: Philip is realistic, “Two hundred denarii would not buy enough to give them a little piece each” (Jn 6:5). Andrew is able to identify five loaves and two fish (that adds up to seven) and the miracle happens. And they gather 12 baskets full of left-overs!! Elsewhere, Jesus declares: “I have come so that they may have life and have it to the full” (Jn 10:10). Yes, the presence of Jesus makes all the difference: at the wedding in Cana, at the shores of Galilee, in our own lives! The word of God on this Sunday, at the beginning of the year, invites us to recognize the presence of Jesus in our lives. It invites us to recognize him as the Son of God! Then we will be able to share in the fullness of life: “These are recorded so that you may believe that Jesus is the Christ, the Son of God, and that believing this you may have life through his name” (Jn 20:31).